I started to write a blog about my laundry prowess at one point but for whatever reason I was unable to bring these thoughts clearly to the world and thus relented. If I had to guess what I was thinking on that particular day back in December 2013 (day indeterminate) – putting myself in my shoes and my brain of reference – I would say it would be lamenting having to pay $3.00 for a load of laundry at my apartment complex ($1.50 to wash, $1.50 to dry in the coin operated machines). Not to mention having to trudge up a flight of stairs outside and about 200 feet away through whatever elements present themselves that day I need clean underwear (frigid temps, rain, snow, sleet, rude neighbors who don’t pick up their dog’s poop, what have you). But this is just my best guess. Maybe I was going to launch into a quirky little anecdote about some piece of art I contemplated creating out of the excess lint I found in one of the dryers. Who can say definitively? I miss having the convenience of my own personal washer and dryer within my living space. But ah somethings in life are just a trade-off. So if your socks go missing or you end up with a softball t-shirt you don’t recognize with the #33 on the back of it – we may have bumped laundry universes. Carry on friends and neighbors. Springtime shall be here soon (or at least I dearly hope so). 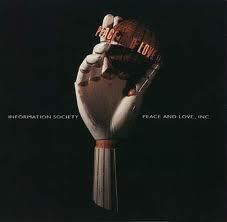 Peace and Love Inc as the group Information Society sang once upon a time in 1992.